One of the movers and shakers of the sci-fi genre, Soviet filmmaker Pavel Klushantsev is often referred to as the “Godfather of Star Wars”. The director of the 1958 film “Road to the Stars” and 1962’s “Planet of Storms” prompted Stanley Kubrick to shoot “2001: Space Odyssey”, which subsequently inspired Georges Lucas to create his famous fantasy space opera. Lucas believed the secret to film is that it is an illusion – a flight of fancy. As a special-effects pioneer, Klushantsev had the talent of turning illusions into powerful works of cinematic art, cutting through time and space with unparalleled creativity, authenticity and style. Klushantsev created a number of breakthrough special effects – according to film buffs, around 300 techniques – and shooting methods, including the so-called “fluorescent shooting” which enabled him to film objects “hanging in the air” in a film studio, by using special paint and light, creating an optical illusion of virtual realities of outer space. The revolutionary Soviet filmmaker managed to hide routine “auxiliary means” like wires, ropes and props, from viewers’ eyes, gaining sought-after authenticity. One of his most famous sci-fi adventures “Planet of Storms” revolved around three Soviet spaceships on their way to Venus. One of them is destroyed, but the other two successfully land on the planet. Before the cosmonauts reunite, they come to grips with scary monsters, a volcanic eruption, and alien life full of fears. 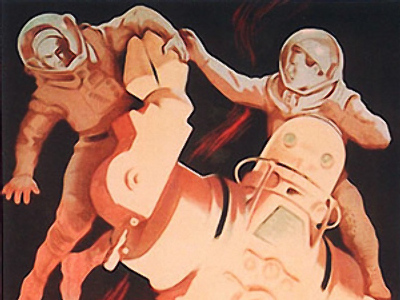 The iconic Soviet film served as a “creative playground” for Peter Bogdanovich's 1968 “Voyage to the Planet of Prehistoric Women” and Curtis Harrington's “Voyage to the Prehistoric Planet”. Decades later, when Georges Lucas was in Moscow during the time of perestroika, he asked the authorities to help him meet Klushantsev. When the officials replied that his name did not ring a bell, Lucas allegedly answered: “He’s the Godfather of Star Wars”. One of film’s true greats, Klushantsev worked on inventing the new resources in film which could enable him to create galaxies, starships, aliens, and robots that did not look fake from top to bottom. Paradoxically enough, Klushantsev was one of Russia’s most underestimated foremost filmmakers. Mazurov told RT why the filmmaker – who was always ahead of his time – was neglected in his own country. He was keen to create unconventional sci-fi adventures that could excite and motivate the imagination of people, especially the young ones. His childhood dream was to become a writer. The dream, however, did not come true until much later, when Klushantsev already made a name for himself as a filmmaker and director of photography. Special effects artist and film historian Robert Skotak, who has won two Academy Awards for “The Terminator” and “Aliens”, reportedly came to Russia back in the nineties to ask Klushantsev about his signature shooting techniques. The filmmakers met in St. Petersburg where Klushantsev allegedly shared a selection of his unique special effects with his American counterpart. The guru of visual effects had an eye for innovation and originality, though he died almost blind at the age of 89. Aristotle said that time crumbles things. Despite stunning visual effects and trailblazing shooting techniques, apparently Klushantsev’s epics also have their sell-by-date and, according to film buffs like Mazurov, have failed to pass the test of time.